Tingoth is down Something odd has happened to Undernet today. I can't get to any of the servers, not even the Canadian or UK servers. That and I'm sick of the songs database getting truncated, and the seen database is over a megabyte in size now, which screams for optimization. I've been considering redoing Tingoth in Python as a project to learn the language, so I guess this is as good a reason as any. For the record, Tingoth was last inhabiting #gothic, #gothik, #gotholica, #gothlinux, and #botyard. For your parusal, here is the songs database, or at least the copy I kept restoring from. Net::IRC::DCC is fixed, with the assistance of yours truly. Now I'm gonna rewrite TinGoth to make use of the excellent Net::IRC Perl modules, so I don't have to write my own DCC routines. bleah. That's really what stopped me writing code long ago -- pouring over unclear documentation of the DCC protocol and source code for the all-Perl IRC client "SIRC". Bad part of using Net::IRC is that it doesn't work on Windows NT machines (with ActiveState's port of Perl 5.005_02). Ah well, I guess I'll be moving TinGoth back to ativan now that ativan.netdesign.net will certainly be stable from now on. Finally resuming work on Tingoth. I lost all my notes on version 2, but c'est la vie. I've had a life for the past long while too; steady job, roof over my head, eating more than once a day, etc. Why am I resuming work after nearly a year of nothing? Two reasons: I discovered there's a project to write the definitive Net::IRC module for Perl. This means I don't have to write the damn DCC GET/DCC SEND handlers! Yay! The documents on the protocol were never very clear anyways. Unfortunately, the module is still in development. I sent them some minor corrections to their DCC CHAT routines, and DCC GET/DCC SEND doesn't quite work yet either. 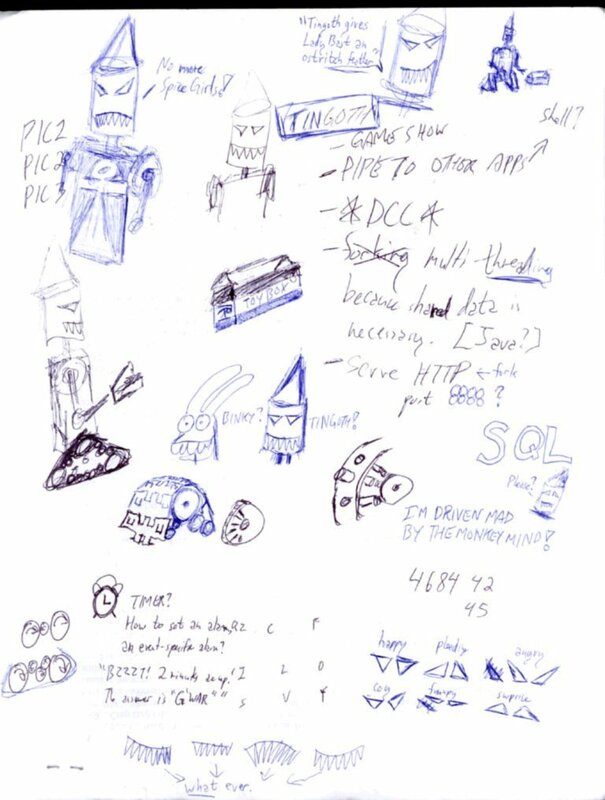 Three years ago, I was so bored working at Bell Global Solutions (I was offically told to stop working due to some office politics, but I wasn't let go for months later) that I refined a little 50-line script into the first version of TinGoth. TinGoth's birthday is in Febuary I'm pretty sure... hard to tell really, since TinGoth was online for a while before becoming "official." Still, with luck TinGoth pre2.0 may be up and running. Backup of the song database (Jan 21 1999). "TinBoth," the barebones bot written in Perl that I've been giving to programmers. The last "tell" notes backup (April 26 1998). All I could recover from TinGoth's songs database after it was corrupted(Dec 31 1997; recovered Feb 01 1998). 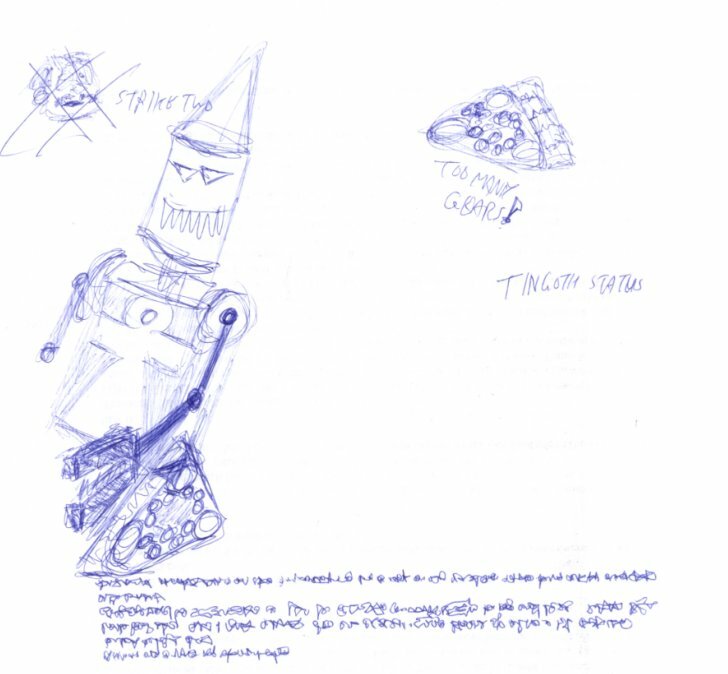 Some sketches of TinGoth the cartoon character (Apr 3 1998). Another TinGoth cartoon sketch. The cool writing script belongs to Jackie Latendrese. (Apr 3 1998). Odd logfile I found during January 1998's salvage... It's six months old but I scratch my head over the errors in the logfile. The Convergence 3 attendee page; people notified TinGoth, and TinGoth would update the web page. The Projeckfest attendee page; same as above, for people who would be in Chicago insetad of San Francisco that weekend. Tingoth's been functioning smoothly for a month now, going down rarely for when I have to reboot Windows NT (more often than I would like). I noticed that Windows NT doesn't shut down console/MS-DOS processes gently, so unexpected reboots case TinGoth to shut down before saving stuff like recent lyrics, notes and seen times. Arrgh. I'm making some headway with version 2.0 of the software... I feel like the bot's parts are in neat little piles located all over the floor of my apartment. Completed objects are the User database (now holding seen and "tell" notes), the JukeBox and the ToyBox, but the IRC connection(s) and web-page serving are still a very incomplete. I need more time. cahughes gave me an idea that I may use to have dynamic command sets for the new bot, and multithreading is so tempting I keep reconsidering not writing the new version in Java. Sorry, I lied. Tingoth.exe is now running as a "service"/daemon of Windows NT. It's up, running on a stable(!) Windows NT machine. The machine might be rebooted -- pity that Perl2Exe doesn't allow the DynaLoader Perl module else I could have TinGoth installed as an NT-server/daemon. All the normal functions are working: "tell", "seen", the toybox, singing, topiclock and puppet commands. The only people who can add new bands are Mozai and Rav3n and Mentat for now. Up really late last night finishing the singing code. I left it running on a Windows 95 machine at home. TinGoth will be reliably online (and named "TinGoth" instead of "Tingoff") by Friday. I really have to get DCC chat done so I can do serious database editing without TinGoth raising flood alarms on IRC servers. Since I started the new job (Feb 10th), I've had barely enough time to sleep, never mind work on TinGoth. I did do some programming recently, on the new GothdeCoder'98. 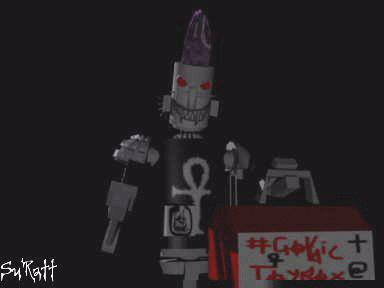 If you're upset that I did that and not even repaired TinGoth... sorry. I got my second ever piece of fan mail for the GothdeCoder 3.x so I got carried away. That and I'm miserably ill with the flu. Didn't manage to work on TinGoth on the weekend; just think about it and get distracted just as I start on it. I'll be performing every night this week so no updates for a while. After seeing that fn0rd is a new bot on #goths (the official reactionary channel of the January 1998 #goth* Undernet games), I felt shamed and disappointed enough to be late for dance class so I could make another go at TinGoth repair. This time I was successful at recovering data from the songs database that needs heavy editing by a human, but at least it's legible text. After five months, I finally have an Internet connection at home. No more sneaking into libraries and having to deal with firewalls to get my email, well, except my own firewall. TinGoth has been brought down. It makes me sad to see that the bot can no longer sing, dispense toys, take notes. One feature after another has stopped working (if the filename dates can be trusted), and when the bot reported it hadn't seen me in eight months, I decided to pull the plug. The song database is quite quite corrupted -- next version will NOT use someone else's precompiled db routines. Wow. I haven't been able to get to ativan.netdesign.net in two months, and TinGoth is still going. I done good; it should hold up until I get a phone again. I hope nobody minds that I've stopped improving it since September.